As one of the most ubiquitous crops in the world, the potato is poised to feed the entire world. Along the way, scientists discovered that the popular staple of many people’s diets may also have potential to help power it as well. 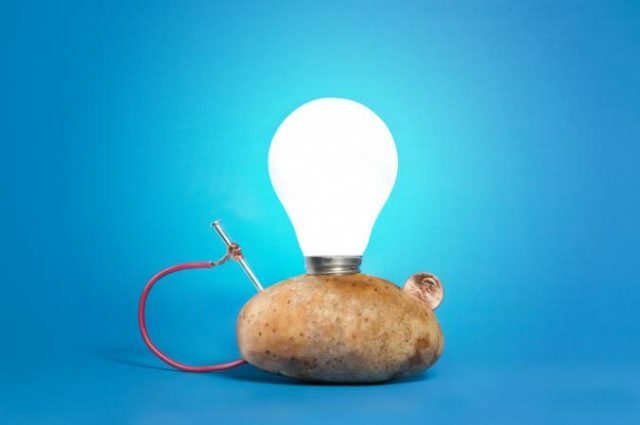 A couple years ago, researchers at the Hebrew University of Jerusalem released their finding that a potato boiled for eight minutes can make for a battery that produces ten times the power of a raw one. Using small units comprised of a quarter-slice of potato sandwiched between a copper cathode and a zinc anode that’s connected by a wire, agricultural science professor Haim Rabinowitch and his team wanted to prove that a system that can be used to provide rooms with LED-powered lighting for as long as 40 days. At around one-tenth the cost of a typical AA battery, a potato could supply power for cell phone and other personal electronics in poor, underdeveloped and remote regions without access to a power grid.